They didn’t eat the baby; it was…chicken, actually. Nanny McPhee: How’s the reading coming along? Evangeline: Much better but I haven’t got to the end of that story yet. Nanny McPhee: No need, you are the end of the story. Loved, loved, loved Nanny McPhee! The perfect blend of whimsy, humor, naughty children, and romance. 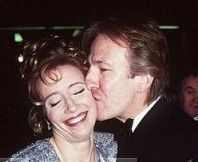 Emma Thompson adapted the screenplay from a children’s book and also starred. She returns as producer, writer, and star for Nanny McPhee and the Big Bang. The sequel also stars Maggie Gyllenhaal, Maggie Smith (2 good Maggies), Ralph Fiennes, and Rhys Ifans. Great cast but I can’t decide from the trailer how this one is shaping up. Of course, I wasn’t sure about the the first one and it’s one of my favorites. A few little points of interest from development land. A few more projects in development that have piqued my interest. Apparently, this week the theme is Harry Potter.